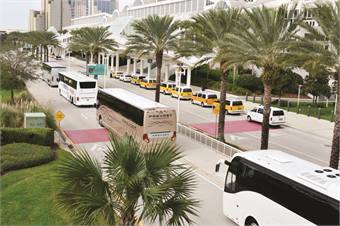 A new United Motorcoach Association (UMA) Expo was launched in Orlando, Fla., in January as part of Travel Exchange, which brought together the UMA Expo with the National Tour Association’s Convention. The intent of the co-located show was to provide operators with a more comprehensive understanding of the entire group tour and travel industry and help form partnerships and business relationships with everyone involved in the group travel industry. With that, optimism filled the air as operators learned ways to improve their businesses and how they fit into the nation’s overall transportation plan, as well as got a chance to see the latest technologies on the show floor. 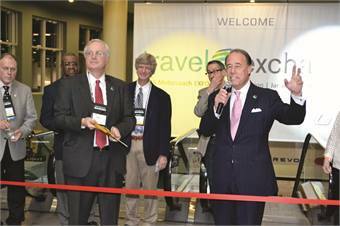 UMA board of directors Chairman Bill Allen (left) and UMA President/CEO Victor Parra opened up the show floor. 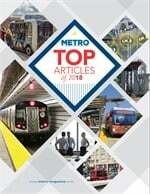 Bronrott discussed the 24% increase in the number of inspections of motorcoaches from 28,915 in 2009 to 35,791 in 2012, resulting in putting 28 unsafe motorcoach operations out-of-service last year compared with zero in 2009. He also spoke about some of the new changes coming down the turnpike as a result of the new transportation bill signed last summer by President Barack Obama — Moving Ahead for Progress in the 21st Century (MAP-21) – including a new safety ratings system, safety audits for new entrants within 120 days of receiving operating authority and a written examination that carriers must take to prove an understanding of federal rules. Bronrott also discussed recent changes to the Safety Measurement System, the key component of the Compliance Safety Accountability program; the new “Safer Bus” app that enables consumers to review a company’s safety record before buying a ticket; and ongoing work to possibly revise and/or revamp the federal Hours of Service rules. Later on during the session, UMA’s VP, industry relations, Ken Presley further discussed the impact of MAP-21 and told the audience that a final rule on seat belts is expected this year, possibly in March, which at this point will not require operators to retrofit the approximate 29,000 commercial buses currently on the road. The door has been left open, however, to possibly make retrofitting a requirement later on down the road.